Are we losing our world-famous gift of the gab? In an attempt to save our traditional national pastime, a pub in west Cork has banned people from using mobile phones. Billy Fleming, owner of the Anchor Bar, in Courtmacsherry, has said that the locals who drink in his pub support his decision and that mobile phones have gradually killed conversation over the last few years. It’s true, they have and they do. Any night out these days is interrupted by phones ringing, beeping or vibrating. Even meeting a friend for coffee will be disturbed by noise coming from the phone. Phones are ruining the art of conversation. In some pubs in the UK you don’t even need to speak to a barman. In an ‘iPub’ customers can order drinks from a tabletop iPad and pull their own pints from a row of self-service taps. Just as we are forgetting how to write by hand, will we eventually forget how to speak? Can bars curtail the use of smartphones without losing customers? Is it a risk they need to take to get people talking? It is estimated an average person spends 24 hours a week online, twice as long as 10 years ago. We check our phones on average every 12 minutes, but we’re not speaking to people. We spend less time making calls than before. Total outgoing calls are decreasing daily as people turn to WhatsApp and Messenger. It’s true, but we are addicted to phones, we rely on them, we feel panicked if we lose them. We are addicted to instant responses and information. We panic or get the hump if someone doesn’t text back within minutes. Maybe, just maybe, that person has turned their phone off and is having a glorious time relaxing, reading or talking to someone without interruptions. You see it with teens now, they go back to each others’ houses and sit beside each other on the couch, but no one speaks. They are all stuck in their phones. Do we need to ban them in schools as well as pubs? Yes, and there is proof that banning phones in schools improves social interaction. Terry O’Sullivan, principal of Blennerville National School, in Kerry, who banned mobile phones last spring, said that within a week the children’s behaviour and moods had improved. 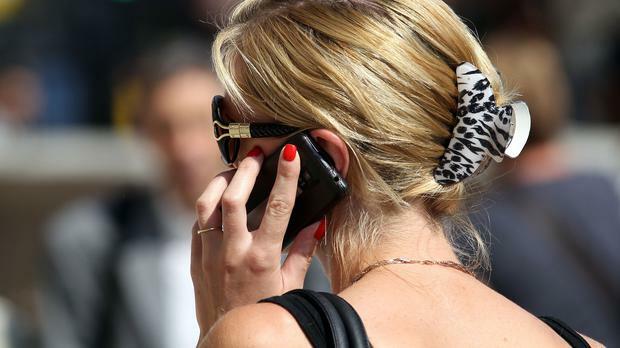 A poll of 1,000 second-level teachers shows more than 60pc would like to see a ban on mobile phones in schools. Teachers are being driven crazy with students checking their devices in class on a regular basis, inappropriate content being sent around and bullying online. France has taken a lead on banning phones in schools by passing a law that bans phone use in all primary and middle schools for the day, including breaks. Banning phones in pubs and in schools is a fantastic idea. They should ban them in cinemas and cafes too. Children don’t need phones in school and if an adult needs to make a call, they can simply step outside like smokers do. It’s simple manners. We need to seriously think about how technology harmfully affects our social lives and act before it’s too late and we’ve lost our world-famous gift of the gab.